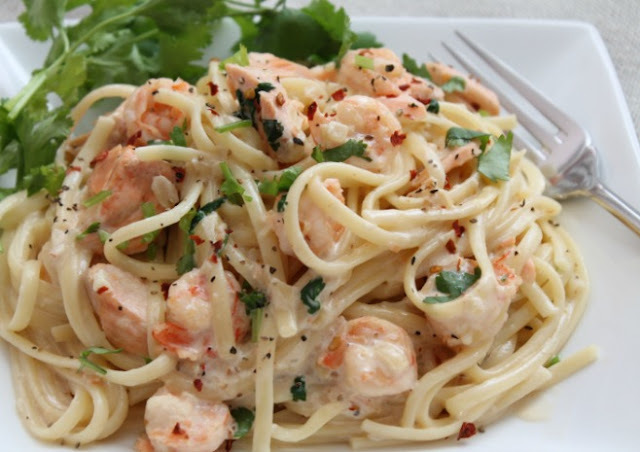 my bare cupboard: Salmon and shrimp linguine "
I made this pasta last week and it is almost the same recipe as the one that I've made for our New Year's dinner . I had to cut back the cream cheese since I've been planning at that time to bake this cold oven cream cheese pound cake . If you haven't tried that cake yet , do bake it , and don't forget to add fresh ginger . But don't worry , I think the steamed salmon and shrimp offset the calories in cream cheese . Hah ! * Boil pasta according to package direction . 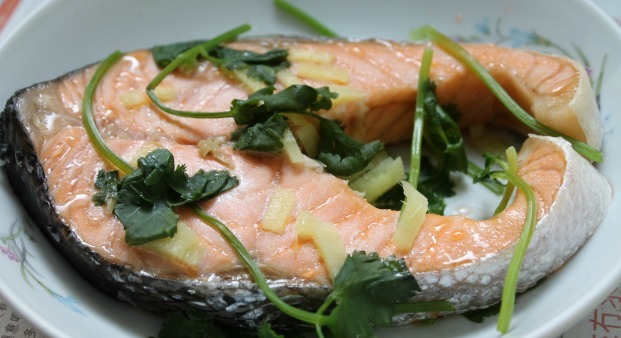 * Meanwhile , heat wok or a large pan , pour in a little bit olive oil , fry shallots and garlic until fragrant , add in the salmon and shrimp , gently stir until shrimp changes color , sprinkle in some salt ; transfer to a plate and keep warm . * In the same pan , pour broth , pasta water , cream cheese and evaporated milk , let simmer for 2 minutes or until cream cheese melts ; add in chili flakes , some salt and black pepper then add in the salmon , shrimp and half of the chopped cilantro . Cook for a minute or so , adjust taste . Turn off heat . * Drain pasta , either add pasta to the sauce and mix thoroughly or put some pasta in a bowl or a plate and pour in some sauce . Garnish with some chopped cilantro , chili flakes and black pepper . Serve immediately . i'm sure neu would love this! Your pasta looks delicious! I could dig into a bowl of that right away! yum yum, this is perfect for a lunch, i like to cook pasta for lunch nowadays..
hello anne, though i've never tried cream cheese in pasta, they sound yummy to me! this looks good! this is a beautiful dish! mmmmm i need some of that yummy fishy goodness lately. my brain's gone all fuzzy with january, needs something to recharge it. this will do! Delicious pasta! First thing, I would never have thought to steam the salmon first, and secondly I have never tried cream cheese with pasta. I have always used grated cheese, cooked them till they are melted, but have not tried with cream cheese before! Love it! I am planning to make shrimps this friday.My daughter does not eat it so I have to make this linguine for her. Like what Alvin says... YUM! 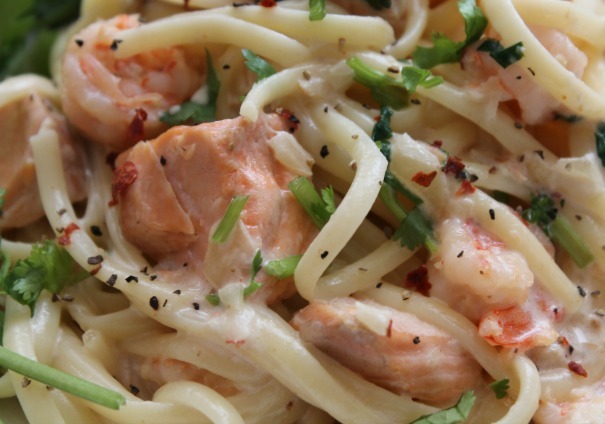 Oh yum, I just ate some shrimp linguine, but the addition of salmon? Genius! Hi Anne, this looks delicious. I never thought of adding shrimps, yummy! This plate of linguine is so tempting. Cream cheese, salmon and the shrimp...all added together..like Alvin and Zoe said YUM..YUM! !